I was fascinated when, in mid October, occupiers erected a tent city (against the instructions of park owner Brookfield Office Properties). The very form of the spatial occupation had transformed; an official public space had become an unofficial private space. Initially, crowds of discussants created a place akin to the the Greek "agora". However, after the construction of the tents this "agora" began to look more like a squatter city. The importance of this transition lies in the difference between official public and unofficial private. 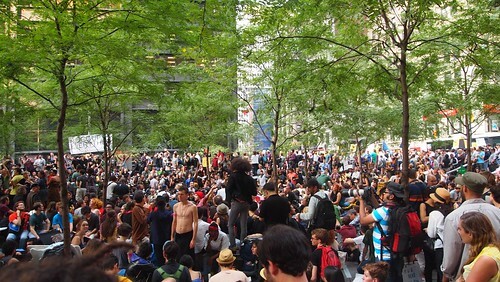 A speaking square, much like the public square form that existed in Zuccotti before it was tented, represents a true public democratic forum. One where people can speak their mind and (ideally) represent themselves on even ground. All space, with exception to some OWS administrative spaces (kitchen, medical tent, media center), were open for people to be in, prior to the parks tenting. 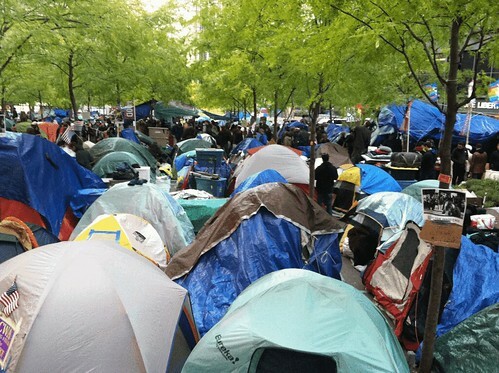 However, with the construction of the tents, this official public space became an unofficial private space with ad hoc residential streets and private encampments; in some cases people got to be very possessive about their space. The public forum gave way to private cul-de-sacs of tents, "do not enter" dead ends, and guarded/ exclusive fabric bounded constructions-- whether or not it is valid, the tent city was undeniably the genesis of Bloomberg's OWS safety and sanitation concerns. 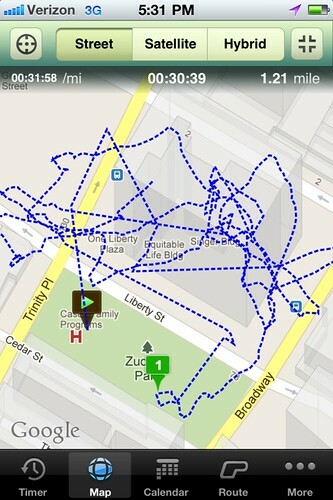 I was very interested in mapping the dense networks of public thoroughfares and private residences in Zuccotti. 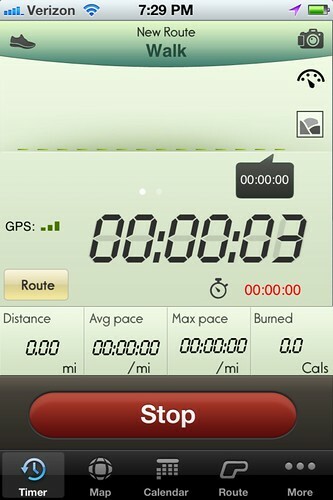 My first thought was to use some sort of GPS technology so I went on the app store and searched "GPS tracker", "Walk Watch" was one of the first free options. When you turn the app on it prompts you with a simple start/ stop watch. When you click start you commence a GPS recording device that creates a blue dotted line every place you go– My mapping effort consisted of walking around the Zuccotti park with the GPS locator on. I attempted to walk through every accessible thoroughfare, and by doing this establish a line map of places that were ok to be (official public) and places that were closed off (unofficial private). The GPS was far less reliable that I hoped it would be. It worked far better on far bike rides than it did on accurately depicting micro-routes in a 1 block radius park. Regardless, it does convey the complex and segmented nature of the new "unofficial private" space. I believe I addressed every possible pathway through the park and the entire walk took 32 minutes and covered 1.2 miles.